The bananas were gone. In the exhibition Video Art in Latin America, at LAXART in Los Angeles in 2017, only fruitless stems remained. José Alejandro Restrepo’s installation Musa paradisiaca (1996/2017) consisted of heavy banana bunches and flowers interwoven with thin ray-cathode tubes. These projected black-and-white footage onto small mirrors: the massacre of United Fruit Company plantation workers following a 1928 strike in the town of Ciénaga, Colombia. The work established a direct link between the tropical fruit and tragic episodes in U.S.–Latin American relations and economic history. Between the opening of the show in mid-September and my visit in late November, however, the bananas had slowly ripened and fallen off, their rotting state drawing intolerable numbers of insects and forcing the fruits’ removal. What was left was equally haunting: dangling skeletal remains that swayed in response to visitors’ movements. Musa paradisiaca served as one of six anchoring installations in Video in Latin America, part of Pacific Standard Time: LA/LA (Los Angeles/Latin America), a Getty-sponsored, southern California–wide constellation of exhibitions centered around Latin American and Latino Art last fall. It was also evidence of the complex nature of this unpretentious but ambitious exhibition. Video Art in Latin America represented the culmination of over a decade of research for curators Glenn Phillips and Elena Shtromberg, whose engagement with the subject dates back at least to the 2004–05 screenings Pioneers of Brazilian Video Art 1973–1983, and Surveying the Border: Three Decades of Video Art about the U.S./Mexico Border, which they organized at the Getty Research Institute. Phillips is curator and head of Modern and Contemporary Collections at the Getty Research Institute, specializing in postwar and contemporary art, including video, performance, and other time-based practices. Shtromberg is a professor in the department of art history at the University of Utah, specializing in modern and contemporary Latin American visual culture, with particular focus on Brazil and the U.S.–Mexico border region. With its inclusion of complex installations, Video Art in Latin America represented a departure from the video-series format of the 2004–05 projects, not only creating a bridge to the rest of the multimedia exhibitions in PST: LA/LA but demonstrating the mutability of the medium and the range of its twenty-first-century practitioners. Yano-a (2005), by Brazilian artists Gisela Motta, Leandro Lima, and Claudia Andujar, consisted of a moving image of a hill on fire, projected onto a wall. Upon closer examination, it became clear that the image—an iconic frame by Andujar, whose work photographing the Yanomami tribes in the Amazon has received attention worldwide—was not a video but a photograph, brought to life by a fan blowing ripples onto water in a transparent tray that had been placed on top of the photograph, which in turn lay on the glass bed of an overhead projector. The installation challenged the notion of video art as a prerecorded medium and drew attention to the projector as an intrinsic part of the reproductive apparatus of visual media. By grounding the work in a photograph, the piece also underscored the connection between moving and still images, and offered a material sleight of hand by using air and water to activate fire. Not unlike the political message of Musa paradisiaca, Yano-a literally shed light on the plight of a repressed and underserved human group—here, Amazonian indigenous communities—as well as on the exploitation of natural resources in the region, speaking to environmental concerns manifest throughout the exhibition. Surrounding the main gallery space—which also contained installations by the U.S.–Dominican artist Joiri Minaya, the Argentines Carlos Trilnick, and Gastón Duprat and Mariano Cohn, and the Mexican Pola Weiss—approximately sixty videos from twenty-one countries were distributed among three small screening rooms. Each of the rooms presented two sequences of single-channel works organized around specific themes: “Economies of Labor” and “Defiant Bodies,” “The Organic Line” and “Borders and Migration,” and “States of Crisis” and “Memory and Forgetting.” The cinematic setting beckoned viewers to stick around; if they did, they would appreciate not only the thematic breadth and diverse visual approaches of the videos chosen for exhibition, but also the poetic transitions that emerged in their sequencing. 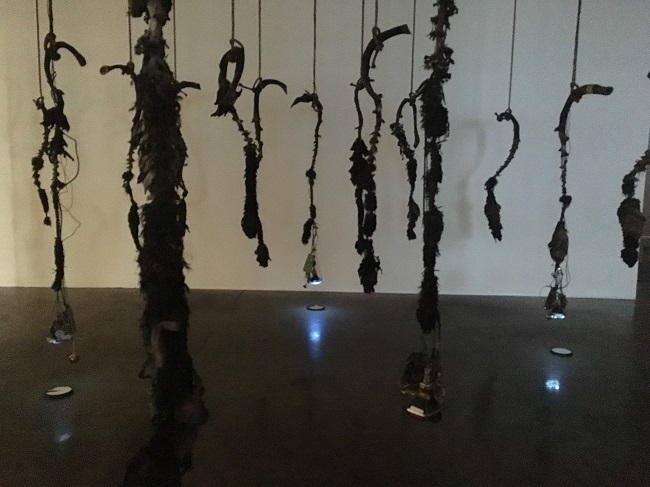 They would also begin to identify rich visual and thematic through-lines in many of the works, which made this an organic and cohesive exhibition. Political protest resonated throughout the exhibition, especially in the early videos by Brazilian artists from the 1970s, some of whom were important participants in art networks described by Shtromberg in her 2016 book Art Systems: Brazil and the 1970s. Indeed, it could be said that video art, since its emergence in the 1960s, has carried the idea of protest in its mediatic DNA. Developed in opposition to television and described by Hans Magnus Enzensberger as “a tool for controlling the behavior of the population,”1 the medium was called into service by Brazilian artists protesting the censorship laws imposed during the 1964–85 military dictatorships. Works such as Letícia Parente’s Marca Registrada (1975), in which she stitches the words “Made in Brazil” into the sole of her foot, or Geraldo Anhaia Mello’s A Situação (The Situation) (1978), in which the artist sits at a table in a suit and tie and drinks pinga, a sugarcane liquor, to the point of collapse, present striking and embodied moments of self-harm as a visceral protest against antidemocratic conditions and staunch nationalism. In her untitled sequence of short videos from 1974–77, Sonia Andrade engages in mundane but potentially violent acts such as hammering nails between her fingers on a table, or trimming the hair on different parts of her body with scissors. Andrade often includes a television set within her videos, nodding to the inescapable presence of the apparatus—mediatic, governmental, and otherwise. Regina Silveira’s unraveling of the word Artifício (artifice) in her like-titled piece of 1977 speaks to the deceit of language and the hypocrisy of government. The viewer had to decipher whether she was unraveling the word by pulling on a thread, or if it was through the shaving off of digital layers that the word begins to vanish. The quality of the 1970s videos drew attention to their materiality as early moving-image works, an idea foregrounded in Videodanza “Xochimilco” (1979), by Pola Weiss, in which the artist dances with her Sony Portapak camera against the colorful backdrop of Mexico City’s Xochimilco canals. Her piece, installed on a standalone monitor in the main gallery, celebrates the new portable camera, which contributed to the rise of video art. Although the history of video art is more complex than a before-and-after narrative involving lighter equipment, the display of an actual Portapak next to the video underscored what artist Martha Rosler has articulated as the necessity for video art to “position itself in relation to the machine,”2 referring both to the actual hardware and the forces in society that led to the rise of television. The exoticism of some peripheries—the faraway tropics—is called into service in this exhibition, but not without a challenge. The colorful piece Zincfonía Tropical (2013), by Panama-based artists Donna Conlon and Jonathan Harker, shows mangoes traveling boisterously across sheets of zinc. With its melding of graphic and sonic pleasure, the starring fruit invokes a sense of exuberance. However, the sheets of metal that produce the compelling sound draw attention to the precarious housing structures that often lie under mango trees, and to the people whose dwellings have only a zinc sheet for a cover. Magdalena Fernández also works with sound in her three exquisite abstract black-and-white graphic pieces in which she animates a dot matrix, a rectangle, and a grid with the frequency of birdsongs. The videos transport the viewer into a lush landscape filled with exotic birds, but without calling on the expected sort of imagery. Joiri Minaya, in contrast, takes the “expected” representation of tropical vegetation head-on in the atrium installation Siboney. A video shows the artist laboriously painting a wall with a tropical leaf motif, then pouring water on her clothes, and dragging—then thrashing—her body across the wall, ruining the design and sullying her outfit. 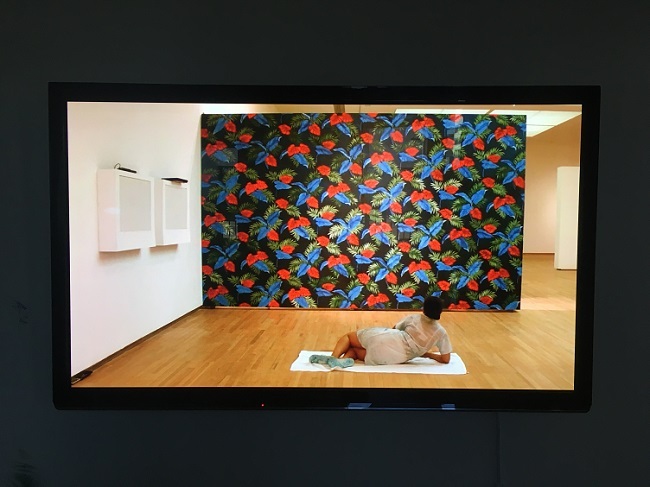 Demonstrating how an “exotic” woman might rebel against expectations, the artist recreated the performance at LAXART, leaving its physical evidence on a wallpapered section of the gallery for the run of the show. Gender-related expectations are also foregrounded—and ridiculed—in Jessica Lagunas’s Para verte mejor (The better to see you) (2005) and Para besarte mejor (The better to kiss you) (2003). Speaking to standards of beauty and appearance usually imposed on women—here, those of wearing makeup—Lagunas applies mascara and lipstick, respectively, until the products run out. The grotesquely made-up eyelashes and lips that constitute the end result of this recorded performance underscore a sense of agony embedded in beauty rituals. Testifying to the depth of research undertaken by the exhibition’s curators, the works selected for Video Art in Latin America allow a potentially infinite map of connections. Antonio Paucar’s Transfusión (2012), part of “The Organic Line,” evokes a similarly rich yet open-ended network. In it, the artist sits shirtless on the floor, holding in his mouth the end of a long straw that has been shaped into a complex pattern on the wall, not unlike a sprawling subway map. Sucking on one end of the straw, he tries to access the wine from amphorae on shelves along the wall. But the straws are imperfectly joined and the wine spills in ribbons through the cracks. The resulting image—of lines bleeding across the wall—speaks with unexpected force to the worlds we navigate, to the idea of networks that we think we control but that can burst at every juncture. Javier Calvo’s Solo yo (Only me) (2012) addresses a comparable arbitrariness—that of maps and borders. The video frames a young man’s chest that shows the outline of Central America burned across it, with a finger repeatedly pressing on the location of Costa Rica: the skin flashes white but inevitably goes back to red. The burn isolates a portion of the American continent with no inner divisions, underscoring the artificiality of national borders inscribed not into territory but onto human-made maps—and importantly, not on peoples’ skin. Enrique Ramírez’s Así… es como la geografía se deshace (This… Is how Geography Is Unmade) (2015) also upends the expected function of maps in his video that shows a swirling waterscape with no horizon in view. The water patterns occasionally look like maps, but they are undone immediately, like arbitrary borders. The darkness of the water is ominous, and relates to the unknown fate of those who were disappeared under the Pinochet dictatorship. Such a sense of unsettledness is also deployed in Cinthia Marcelle’s Leitmotiv (2011), where an ocean of swirling water fills the camera frame, only to slowly reveal that it is soapy water being pushed over a dirty floor by disembodied brooms. Part of the sequence “Economies of Labor,” Leitmotiv hinges on the surprising turn of the waterscape revealing itself to be a dark floor and the suggestion that labor, visible and invisible, often hides at the edges, or outside the frame. Videos that engage productively with humor played to the exhibitions’ strengths in balancing manifestations of violent histories. Cuba’s scarcities inform Luis Gárciga’s Para no envidiar el Jacuzzi (So as Not to Envy the Jacuzzi) (2009–10), which shows the artist lying in a bathtub, blowing into a tube in order to create bubbles for a DIY jacuzzi experience. The piece is short, only two minutes, but it speaks with languor and dark humor to the shortages—far direr, of course, than the absence of private whirlpools—that Cubans have faced for decades. Adrián Melis’s The Making of Forty Rectangular Pieces for Floor Construction (2008) depicts a state-owned manufacturing plant in Havana that has run out of materials. As the camera pans the depopulated factory landscape, the viewer begins to hear guttural noises produced by the workers imitating the sounds of their machines. Forced to appear for work in spite of the lack of materials, their voices build into a humorous crescendo and convey a relentless, forced sort of optimism. 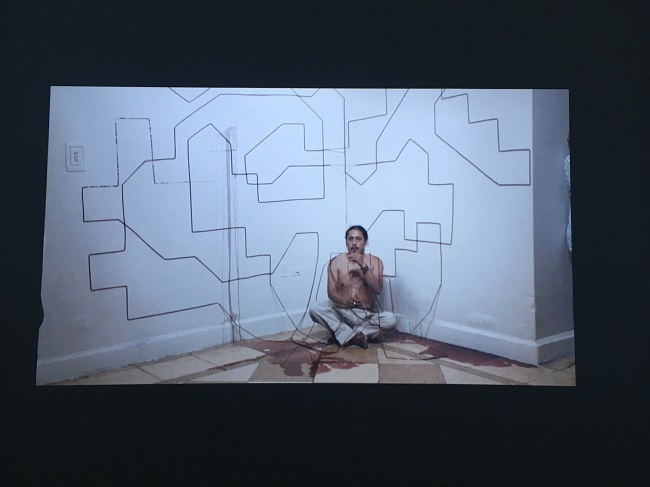 In Gastón Duprat and Mariano Cohn’s Hágalo Usted Mismo (Do It Yourself), a mocking didactic voice outlines elements for a successful video-art piece, such as: displaying “poetry in scroll”; depicting “poor, indigenous people”; and including a voiceover in French, an out-of-focus image, and lots of smoking. They surreptitiously comment on the work that goes into making a video: lots of time (and, perhaps, nicotine). This exhibition similarly required ample time, even just to grasp the individual works’ aesthetic and thematic layers. The curators’ own time investment was evident in the study room, located at the back of the gallery, which included dozens of books on the history of the medium as well as out-of-print or hard-to-access volumes from Latin America—a road map, in library form, of their own research and journeys. The rich and polyvalent display of videos chosen for the exhibition belied the relatively short history of the medium in Latin America and was nowhere more evident than in the dialogues and connections that emerged between the works. It is to Phillips and Shtromberg’s credit that the pieces foregrounded not an unmoored “international art” aesthetic, but a sense of artists deeply engaged with their region’s histories and with idiosyncratic forms of storytelling. This quality extended productively beyond the screens into the physical objects and installations in the exhibition, beginning with but certainly not limited to Minaya’s tropical wallpaper; Motta, Luna, and Andujar’s fire; and Restrepo’s bananas. Hans Magnus Enzensberger, “Television and the Politics of Liberation,” The New Television: A Public/Private Art eds. Douglas Davis and Allison Simmons, (Cambridge, MA: The MIT Press, 1977), 248. Martha Rosler, “Video: Shedding the Utopian Moment,” in Illuminating Video: An Essential Guide to Video Art (New York: Aperture, with Bay Area Video Coalition), 33. Paula Kupfer is an art historian, writer, and editor. Her writing has appeared in The Photobook Review, MoMA’s post, Harper’s Postcard blog, BOMB online, Time LightBox, and Contact Sheet, and she is a contributor to Hyperallergic and the Aperture blog. She was one of the specialists who selected titles for the book CLAP! 10×10 Contemporary Latin American Photobooks: 2000–2016, which was shortlisted for the 2017 Aperture–Paris Photo Catalogue of the Year Award. 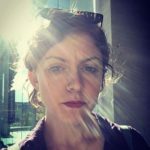 Kupfer has a BA in journalism and Latin American Studies from NYU, an MA in art history from Hunter College, and is pursuing a PhD in art history at the University of Pittsburgh, where her research focuses on networks of displaced and exiled artists and photographers in Latin America. She was previously the managing editor of Aperture magazine and photo editor for The California Sunday Magazine.